In the 4th and final part of our latest style guide, I’ll show you exactly which products to use, so you can “get the look” and achieve your very own Natural Elements bathroom. 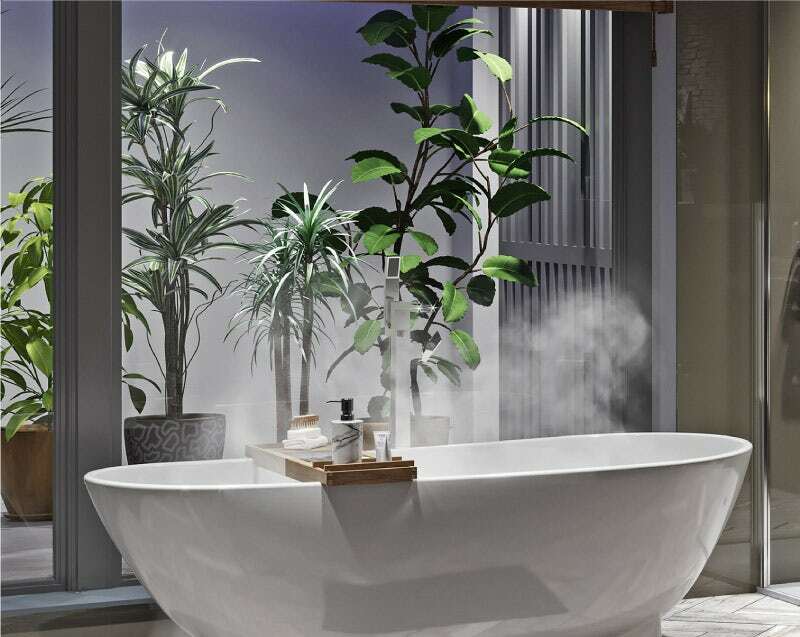 One of the big interior design trends of 2019 is set to be the use of more natural elements within your bathroom space. Whether you use genuine materials like slate, marble, wood and stone, or save time and money by using manmade alternatives, you can easily get the look in your home. If you haven’t done so already, I would suggest reading parts 1, 2 & 3, where I introduced 3 different looks, each containing natural elements. In this article, I’ll take you through my product choices for each look, so you can recreate your favourite design. In part 1, we created a calm and relaxing bathroom with a soothing neutral colour scheme. Reflecting other popular interior design trends, such as “Lagom” and the concept of mindfulness, natural elements in this room include light wood finishes, stone effect tiles This is a more neutral room, so we’ve included a more natural look and feel with light wood furniture, wood effect panels and bamboo accessories. The Mode Foster freestanding bath with bamboo bath bridge is the perfect choice for a mindful, relaxing bathroom space. Featuring a simple shape in which you can easily lie back and relax, it also comes with a bamboo bath bridge which can be slid backwards and forwards on specially-designed grooves. 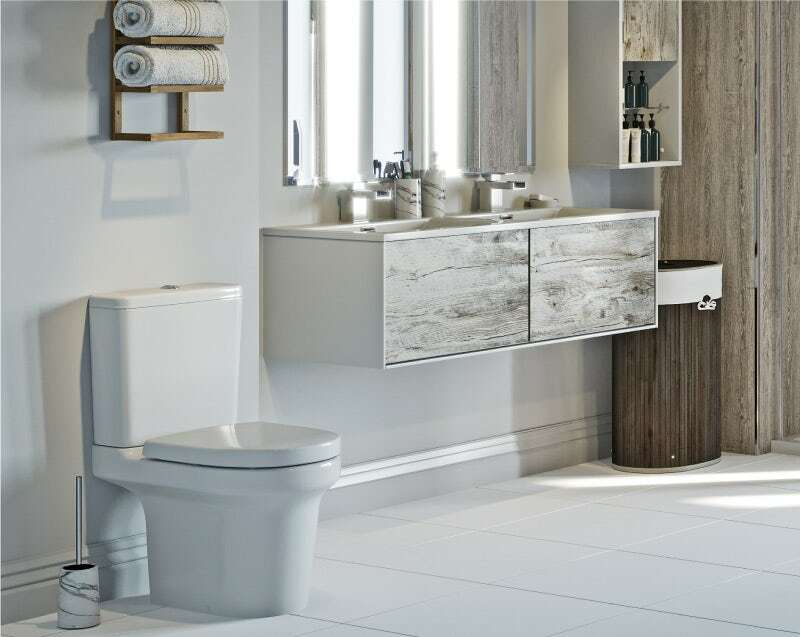 Clean and contemporary, the Mode Burton close coupled toilet with soft close seat complements the soft, soothing décor. Plus, with a soft close seat, your space remains an oasis of calm. To keep with the light wood theme, the Mode Burton white & rustic oak wall hung double basin vanity unit & storage set is ideal. 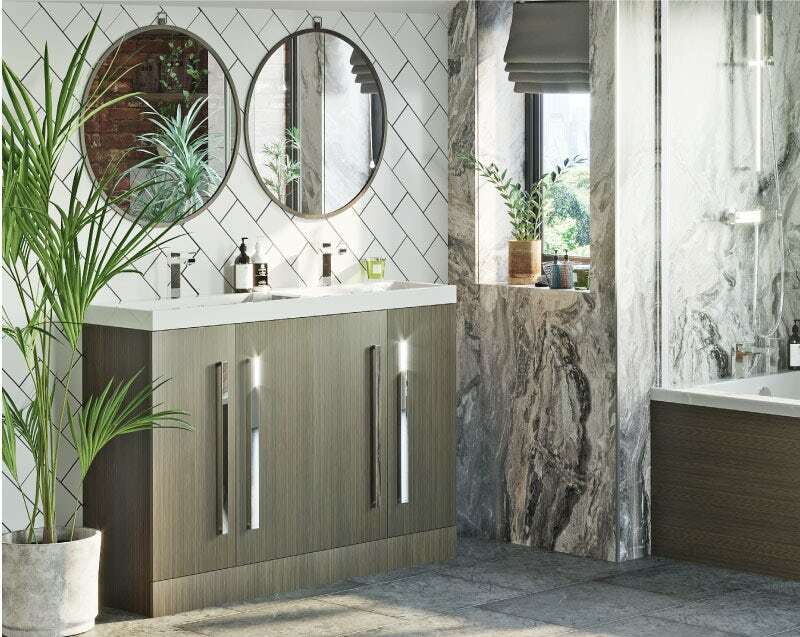 With a combination of white gloss engineered wood and oak effect fascias, it will help to keep your bathroom neat and tidy—truly a space to be mindful in. Giving your space room to breathe, the Mode 8mm wet room panel pack with hinged return panel provides a contemporary, open plan feel. What mindful bathroom would be complete without the most relaxing of showers? 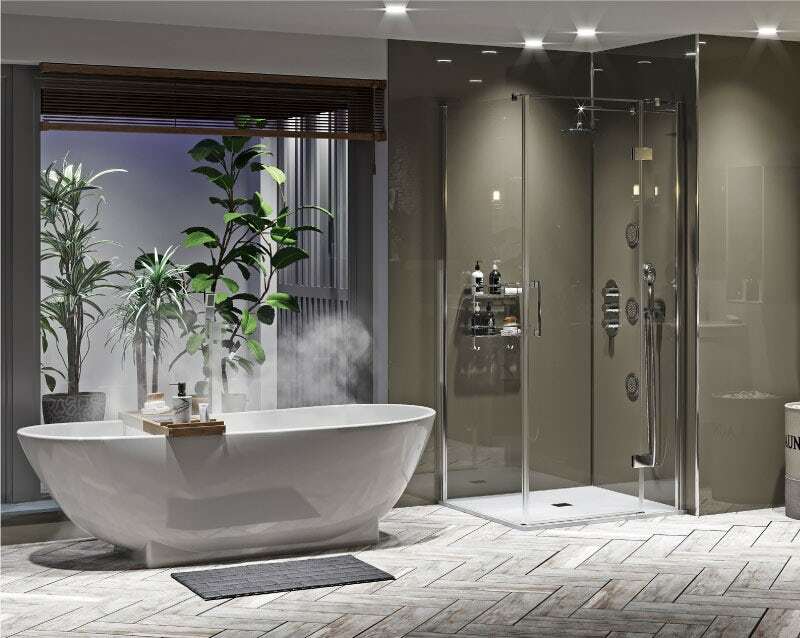 The Mode Spa complete round thermostatic triple shower valve with diverter and wall shower set provides an overhead drench shower, handset, plus 6 invigorating body jets. With a waterfall spout which allows water to gently cascade into your bath and basin, the Mode Carter basin mixer tap and bath shower standpipe pack is both soothing and calming, for a mindful experience. With a Multipanel Classic Monsoon Hydrolock shower wall panel, you can continue the light wood theme right around your bathroom. Made from waterproof plywood with a high pressure bonded laminate surface, it is quick to install and easy to maintain, adding a more natural feel to your enclosure. To enhance the neutral colour scheme, and to ensure you don’t go overboard with your natural elements, we chose [British Ceramic Tile Pure white matt floor tiles]. The matt finish produces a softer look that is more relaxing. We’ve also added a touch of luxurious marble with Showerdrape Athena marble accessories, including a toilet brush holder, soap dispenser and tumbler. For a contemporary take on the spotlight ceiling fixture, the Forum Ligero 2 light bathroom ceiling light is ideal, allowing you to illuminate specific parts of your room. With this bathroom, we wanted to produce a high-end designer feel without having to pay the designer prices. To achieve this, we have used faux organic materials throughout, from the wood effect vinyl flooring to the stone effect furniture. With soft, sympathetic curves and plenty of room in which to wallow, the Mode Burton freestanding bath will effortlessly complement your chosen style. 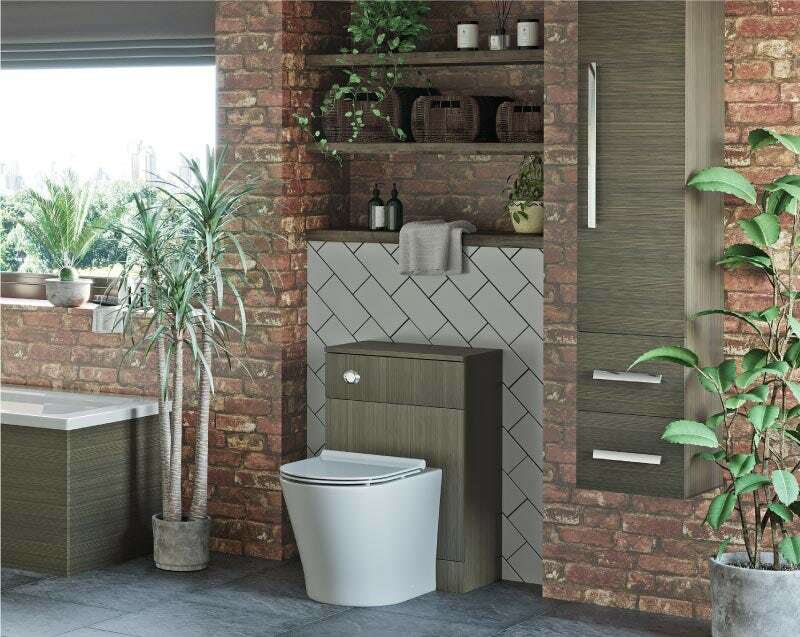 Taking natural forms as its inspiration, the Mode Burton wall hung toilet with soft close seat will produce a cleaner look and feel, combined with a cunningly concealed cistern. 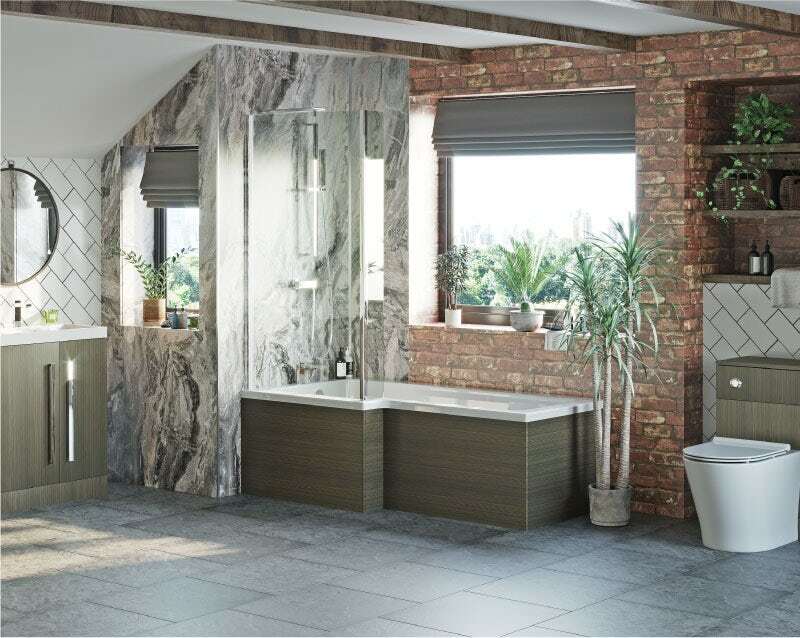 A glorious combination which will certainly improve your storage situation, the Mode Burton ice stone wall hung vanity unit 1200mm & storage set features “ice stone” fascias, which give the appearance of a genuine stone finish. Waterfall bathroom taps are still very much sought after in designer spaces, which is why we chose the Mode Carter basin mixer tap and bath shower standpipe pack. With a contemporary frameless design, the Mode Cooper premium 8mm easy clean square shower enclosure comes with a white slate effect tray, adding a further natural element to your overall design. To replicate the appearance of stone, right around your bathroom, we chose Zenolite plus fossil acrylic shower wall panels for the enclosure area and created a rustic effect using Fine Decor ceramica glitter slate black / grey wallpaper. With Faus Chevron Chic moisture resistant click flooring 8mm, laminate has never looked so chic! With a chevron effect pattern, it’s the quick and easy way to replicate hardwood floors that are simple to maintain. The Hug Rug luxury brick graphite bathroom mat is actually made using bamboo and features a brick effect pattern that complements the walls. Meanwhile, bamboo is used elsewhere with the handy adjustable bath caddy. For another contemporary touch, we’ve added Forum Solis cylinder bathroom wall lights around the mirror, for additional illumination when applying makeup or brushing teeth. In part 3 of this style guide, I showed you how to create a bold look in your bathroom, using different colours, textures and surfaces, combined with different varieties of plant life, to bring the outdoors indoors. Walnut is a great wood finish, adding a slightly darker element to your interiors. That’s why we picked out the Orchard Wye walnut double basin unit 1200mm & storage set to add immediate impact to this bathroom. Perfect for a busy family bathroom, the Orchard L shaped left handed shower bath is multi-functional design at its very best. 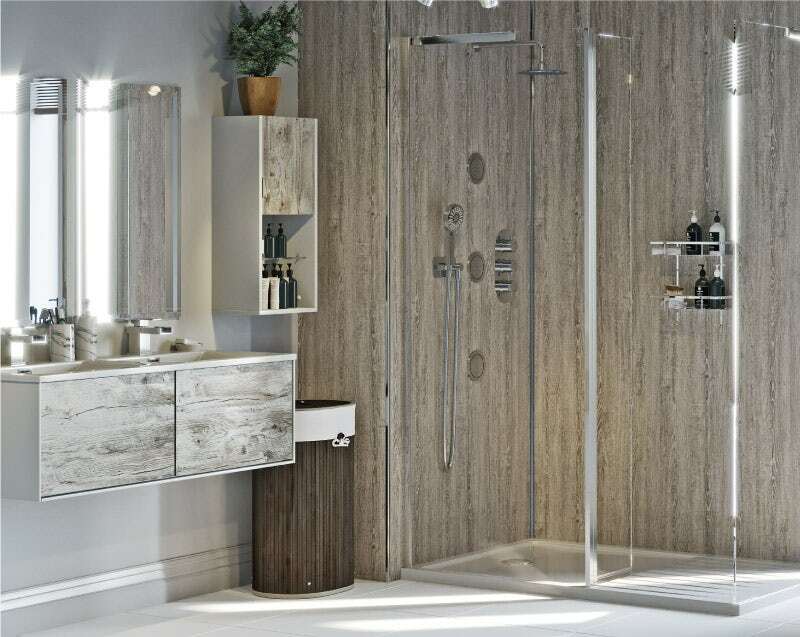 To complement the furniture, we’ve also added the matching Orchard Wye walnut shower bath panel pack. Sleek and stylish, the contemporary Mode Ellis thermostatic slider rail mixer shower is an excellent choice, with a height adjustable bracket and detachable handset, for ultimate flexibility. Keeping with the dark wood theme, we chose the Orchard Wye walnut back to wall toilet unit with contemporary toilet and seat. This coordinates perfectly with the rest of the furniture. With a clean contemporary look, the Mode Ellis basin and bath mixer tap pack provides easy control over water flow and temperature. We used three different wall treatments to add a range of organic looks, including the gorgeous Multipanel Linda Barker Calacatta Marble unlipped shower wall panel providing added protection around splash zones. For a rough and ready rustic appearance, we also chose Fine Decor rustic brick sidewall red wallpaper, which is quick, easy and inexpensive. To break up the dominant darker colours, we also introduced [British Ceramic Tile Maxi Metro Pure white matt tiles] in an intriguing pattern. Slate is a stunning choice for beautiful floors. However, it can prove expensive which is why we opted for [British Ceramic Tile Slate light riven grey matt tiles] instead. Featuring a beautiful bronze frame, the Jacen round wall mirror makes a welcome addition to this bathroom. Plus, with a Set of 3 dark brown water hyacinth storage baskets, the natural wood theme even extends to your storage. Whichever of our 3 Natural Elements bathrooms you love, you’ll find all the products we used in our dedicated collection. Simply click on the banner below to begin browsing. If you’ve enjoyed this style guide, you’ll find plenty more incredible bathroom inspiration on our Get the Look section. 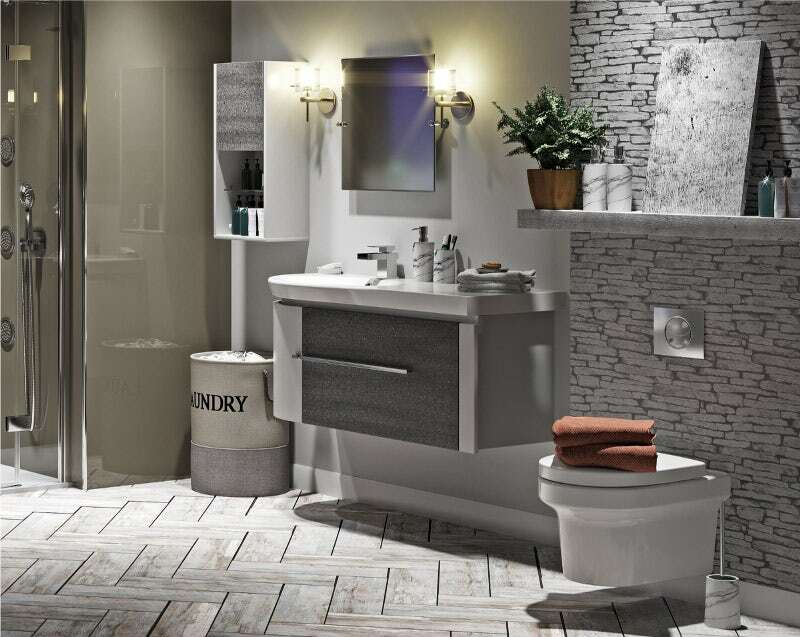 Click on the banner below for on-trend bathroom ideas. In part 2 of our latest 4-part style guide, I’ll show you how to create a contemporary designer look with faux organic materials for a more natural feel. In part 3 of this 4-part style guide, I’ll show you how to "get the look" by designing a bold bathroom with plenty of natural elements. Feeling a little disillusioned with the modern world? Perhaps it’s high time you reconnected with nature? In our latest Get the Look style guide, I’ll show you how to make the most of organic materials in your bathroom to create a space in which you can tune out, relax and be mindful.